The Multifocal that simply works! If you`re in your 40s, you may have found reading has become more difficult. If so, you`re likely experiencing a common vision condition called presbyopia, a natural part of your eyes` aging process. Fortunately, bifocal or varifocal spectacles are not the only option for clear vision. Now you can enjoy optimum vision quality at every distance and the freedom of soft contact lenses, with Proclear® Multifocal lenses from CooperVision. Proclear® Multifocal contact lenses offer a new level of vision quality thanks to revolutionary Balanced Progressive Technology, a unique system utilizing two different lenses that work together to provide clear vision whether you`re looking near, far or anywhere in between. This lens uses the tried and trusted Proclear® material which is uniquely engineered to provide a higher level of comfort, over a longer period of time, than any other contact lens. By utilising a unique material called Phosphorylcholine, which attracts and holds water molecules, Proclear® retains three times more water than other soft contact lenses. And the more water is retained, the more moist and comfortable the contact lenses remain. 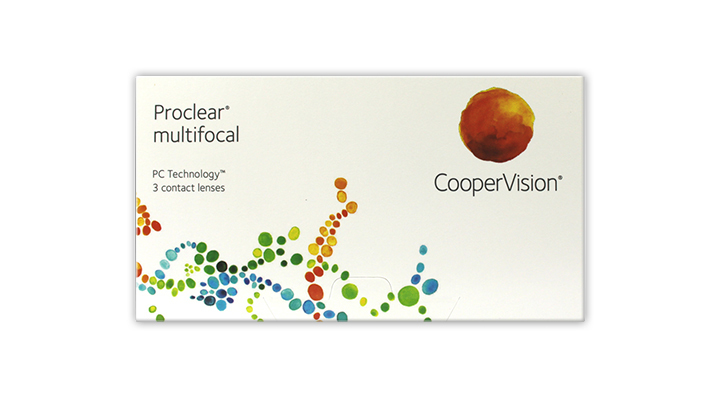 Proclear Multifocal Softlens is amazing. No more reading glasses. Blue Tint makes you see them easy in the solution. So comfortable you don't even know you have a lens in. Definitely a must for every day use. Best of the lot, so far. I work at a computer most of the day and read a lot of paperwork. I also drive so both near and far vision is vitally important for me. I have tried daily disposables but the compromise they offered just seemed too much to cope with. Proclear lenses offer clear vision for both close work and distance vision and they are comfortable to wear. The only downside so far (and I've worn them for two months) is that the distance vision seems to be slightly compromised after a couple of weeks as the lenses seem not as moist as first use and tend to stick to your eyes a bit. Just a bit, though. I can only ask that the weekly version be offered for sale. This would allow more frequent changes and that final problem would be solved.